OAKLAND, Calif. (KGO) -- The Golden State Warriors could make history on Wednesday. On the last day of game of the regular season, they're going for a record-setting win number 73, which no other NBA team has ever reached. 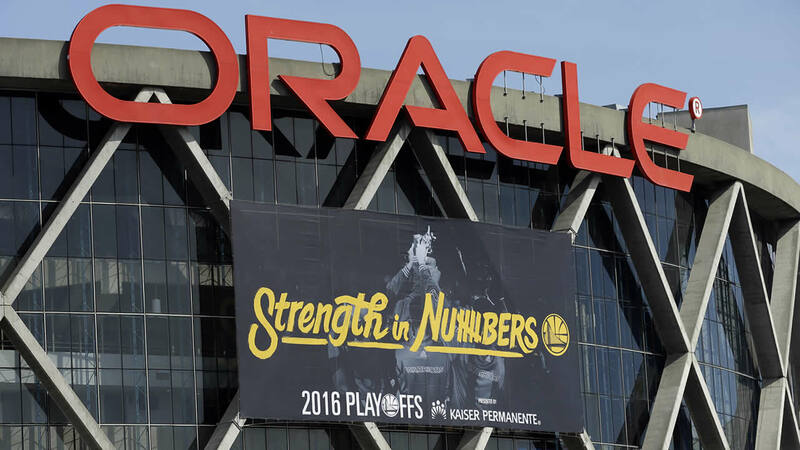 Sky7 HD flew over Oracle Arena on Tuesday morning where the banners for the playoffs are up, reading "Strength in Numbers." What would normally be a throwaway game at the end of the season has become a must-watch event. In fact, the Warriors on Tuesday received a visit and some well wishes from some other big name players who just happened to be playing at the Coliseum next door. "We have an opportunity to do something that's never been done in history," said Steph Curry. The Warriors star is well aware of what's on the line Wednesday night. And he knows that whatever happens Dub Nation, the fans at Oracle Arena, will be right there with him and his teammates. "The amount of support they've given us through the rough years, I think it's well worth the wait to have another notch that they can hold onto as loyal fans of the Warriors," he said. The star forward tweeted he will donate two tickets each to three Oakland high school students with high grades. Going to buy 3 tickets and find an underprivileged kid in Oakland and allow them to witness history Wednesday!!! Let's get it fellas!!! Draymond Green is treating three high school students to the game, including Joseph Martin of Coliseum College Prep, who immigrated from Liberia, and Dyllon Louis who has a 3.73 GPA at McClymond's High School in West Oakland. "From what we're picking from, they've earned this. Obviously, they're not doing what they're doing for this, but when you do right, good things happen to you," Green said. 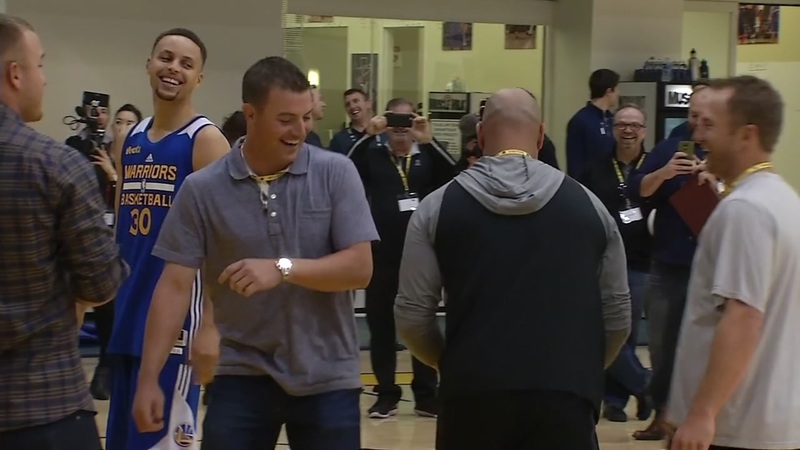 As they have all season, the Warriors know how to mix in the fun with the winning. Several baseball stars from the Los Angeles Angels stopped by to play horse with Green and Curry. They included Albert Pujols, Mike Trout, and former Oakland Athletics player Cliff Pennington. "You get to see a guy who's the best in the world at his profession and you can't help but take it in and enjoy it," said Pennington. "It's an awesome experience for us." Trout beat Green on Tuesday, but Draymond assured us that he knows how to get it done on Wednesday when it counts. Ticket prices for Wednesday night's game start at $350. It's the highest price for any Warriors game since last year's NBA Finals. There are many ways to buy tickets, but only one is recommended by the team. "Surprisingly enough, buying a ticket from a third party site, other than Warriors.com isn't all that different from buying from the guy in the parking lot," said Warriors SVP Brandon Schneider. If you want to try getting a re-sale ticket, you'll have to pay for it. According to TiqIQ the average listing price of a ticket on the secondary market is more than $1,300. That's second all-time for regular season tickets. Fans who want to be a part of Warriors history but don't want to spend $350, can watch the game on the silver screen at the Alameda Theatre and Cineplex, if they get a ticket. The Alameda Theatre expects every one of its 750 seats will be taken during a viewing party. "It's a buzz. It's an electricity. It's like being at the game," said Allison Shannon, director of marketing and events for the Alameda Theatre and Cineplex. While the tickets are free, donations are welcome. Last year, the theater raised $10,000 for the Warriors Community Foundation. Oakland City Councilman Noel Gallo, says the team's success does generate revenue for local businesses, but that's not his main concern. "I cannot put a dollar value to it because of the spiritual and positiveness goes beyond the dollar value," Gallo said. It'll cost $2,100 to see Kobe Bryant's final game in Los Angeles on Wednesday. If you want to sit courtside at Oracle, you'll have to pay $18,000. That pales in comparison to the $29,000 it'll cost you to sit next to Jack Nicholson at the Staples Center in LA.